Can we be happy with little when we have come to expect nothing more than that? Perhaps we can also be miserable with plenty when we have been taught to expect and desire everything. Of course, it is also arguably more common that when we have little, we want more and that when we have plenty, we are happy. So what is enough really? As we get older, we generally look for more space, more time, more tranquillity and fewer ‘things’ to replace all that we acquired in the preceding younger years. How do we know we have enough? Do we ever have it? Maybe some people are lucky enough to be in that position already, while others are forever chasing. Sometimes we may take things and people for granted and maybe we already have all that we need. So with this in mind, this week take a moment to look around your life and see what and who you have. Maybe you have more than you know. 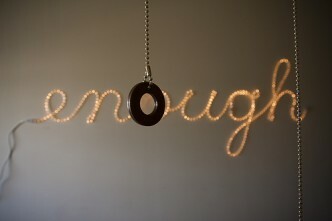 And maybe, it’s enough.